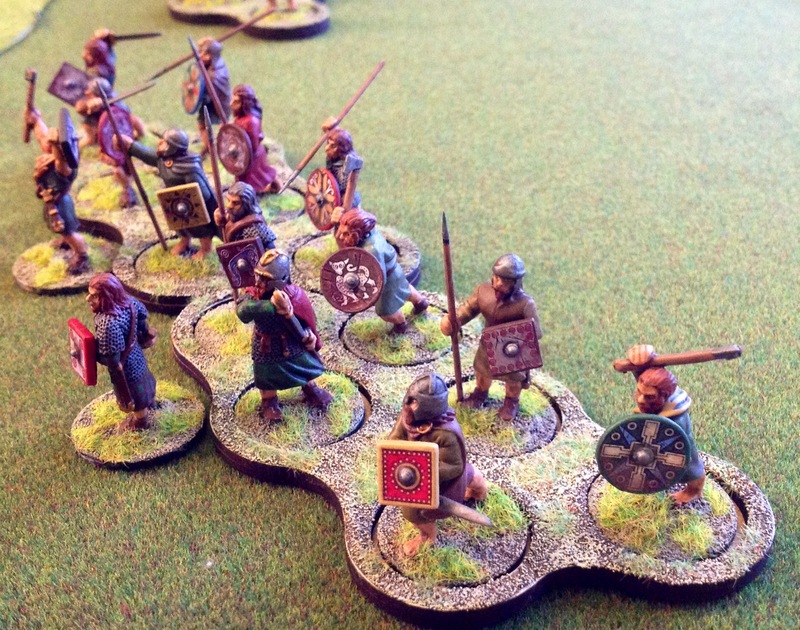 The Picts raided unopposed in April while the British licked their wounds. The loot from this next raid turned out to be some cattle (a cattle raid was the next scenario rolled), so the Pict’s objective for the next game was to drive their loot back across the border. 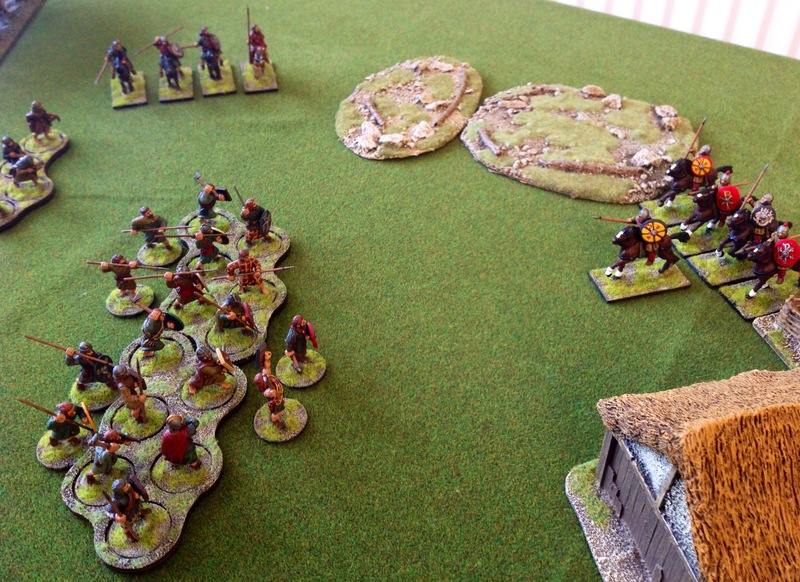 The British came back refreshed, deciding to mount a unit of Warrior Shock cavalry and attach Cinuit (a Status II noble) to it – there is an option for Northern British to mount a unit of Elite Warrior and a unit of normal Warriors, so for this game I decided to try out 1 unit of cavalry per side, albeit the British cavalry would be led by a Noble whereas the Pict cavalry wouldn’t. 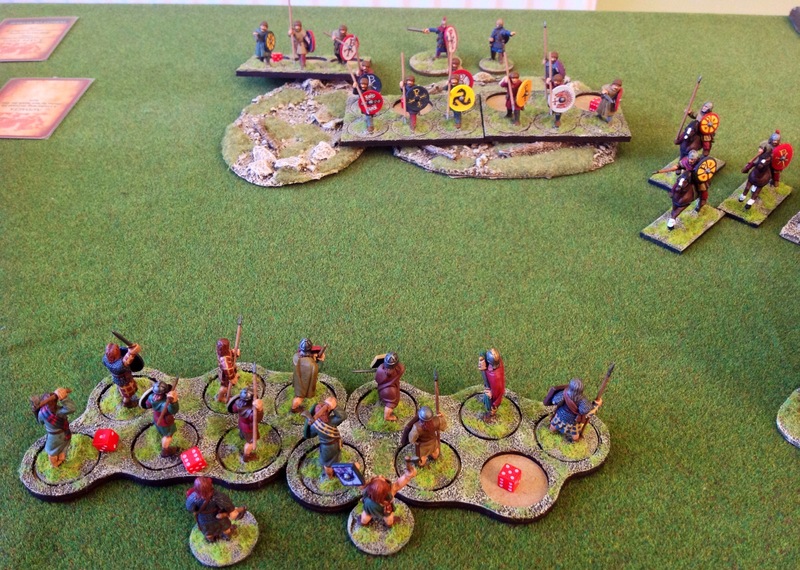 The Picts had been bolstered by 4 Raiders joining them lured by what seemed like easy pickings. 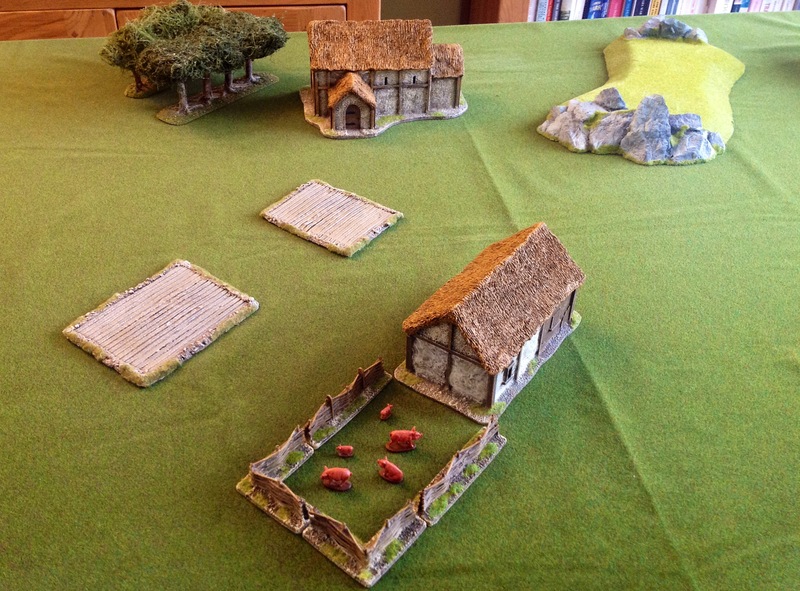 I rolled a double for terrain, so there was going to be a river with a ford placed – not what you want when you are trying to drive cattle to the opposite board edge! 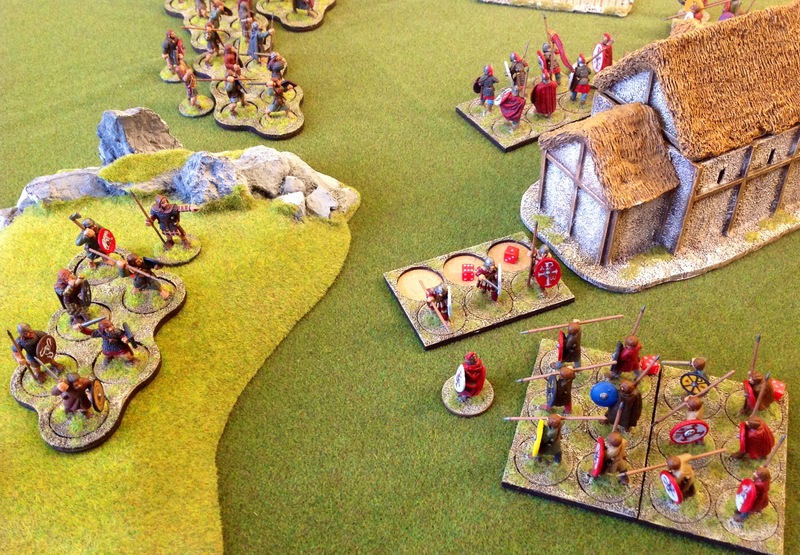 The Picts rolled only a single move before British arrived on their left. 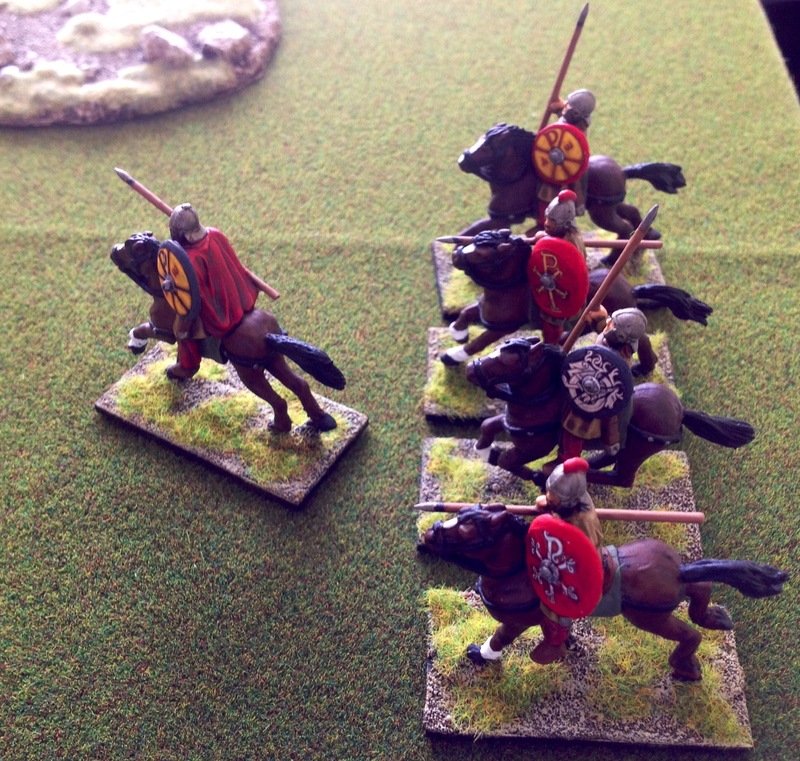 The British also rolled badly and had a single unit arriving on turn 1 so chose their cavalry. 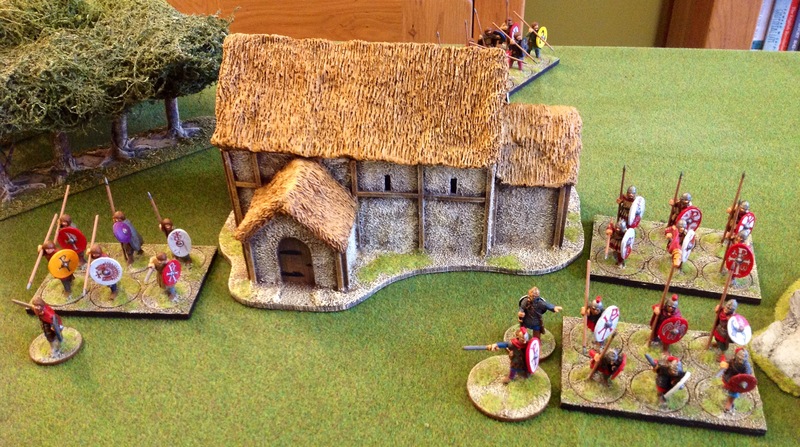 The Pict plan was to seize the ford with their cavalry while the crossbows and 3 groups of raiders took on whatever came on on their flank. 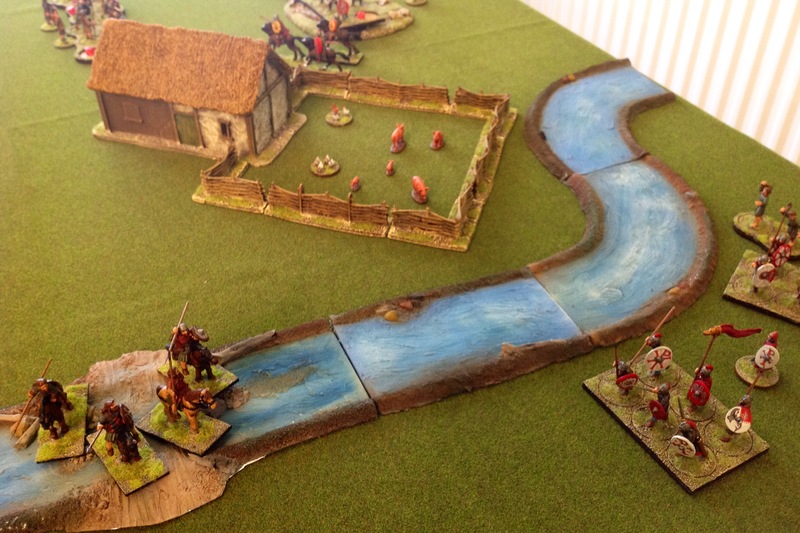 The Raiders with the cattle were to follow the cavalry to the ford as quickly as possible. 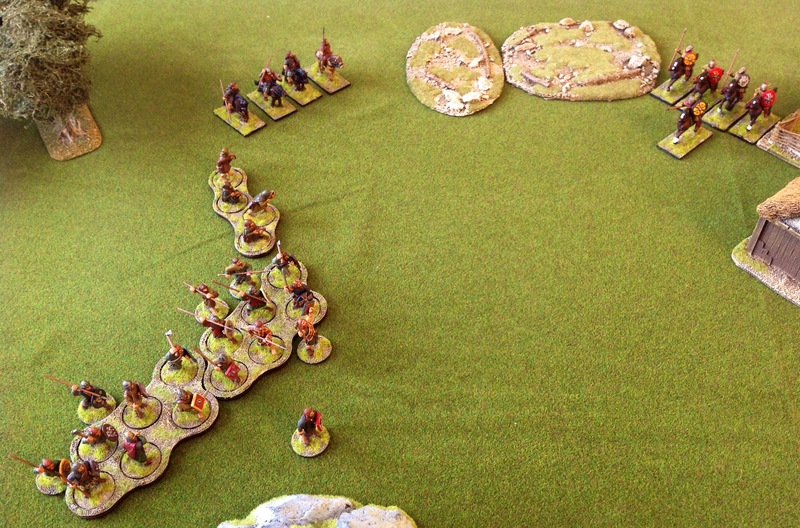 In turn 1 the Picts advanced as far as they could while the sole British cavalry unit watched and their Noble build up his card hand. Things changed in Turn 2. 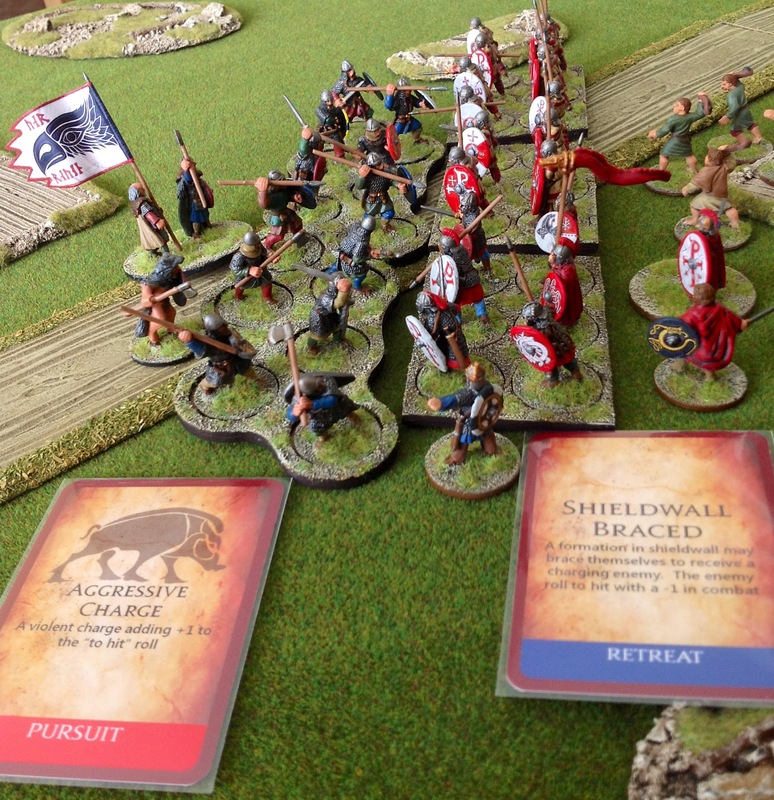 The Pict crossbows knocked 2 British cavalrymen out of their saddles, but got too close to the board edge and were dispersed by the speedy arrival of the British Lord with his Levy. Dumgal, the British Noble with the remainder of the British forces, brought them on on the other side of the river and headed straight for the ford. 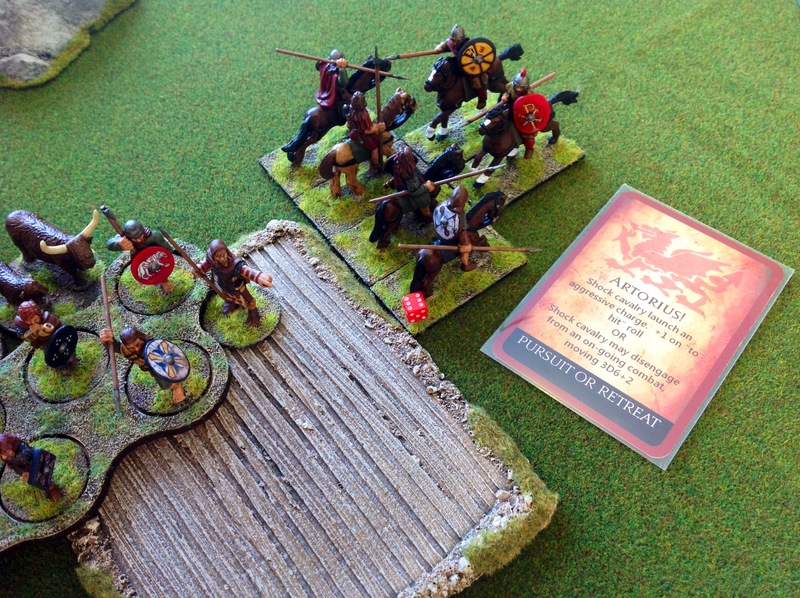 The Pict Lord’s card came up so he charged the British Levy before they could get into shieldwall, boosting his level by 2 by playing an Audacia card. 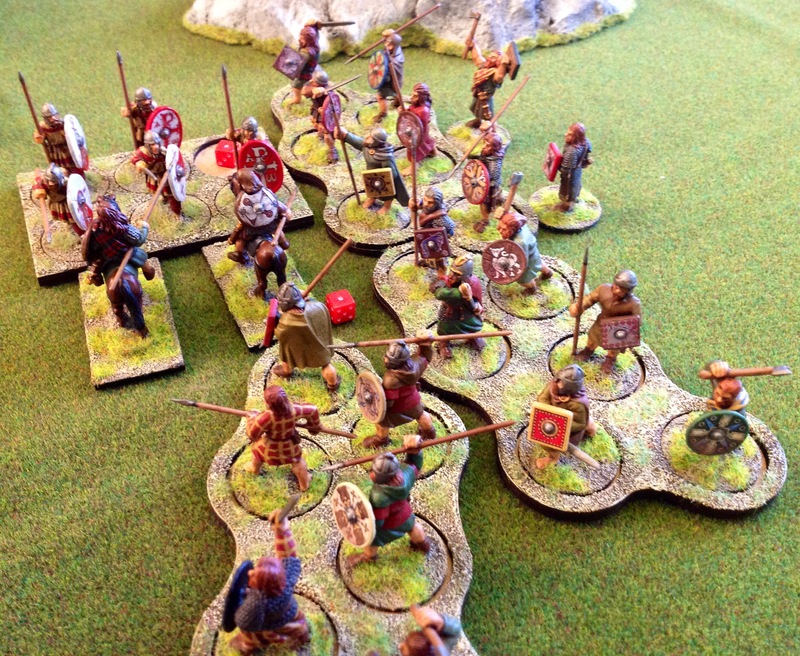 In the fight the Picts killed 1 and caused 9 shock, but lost 2 men and 5 shock in return. 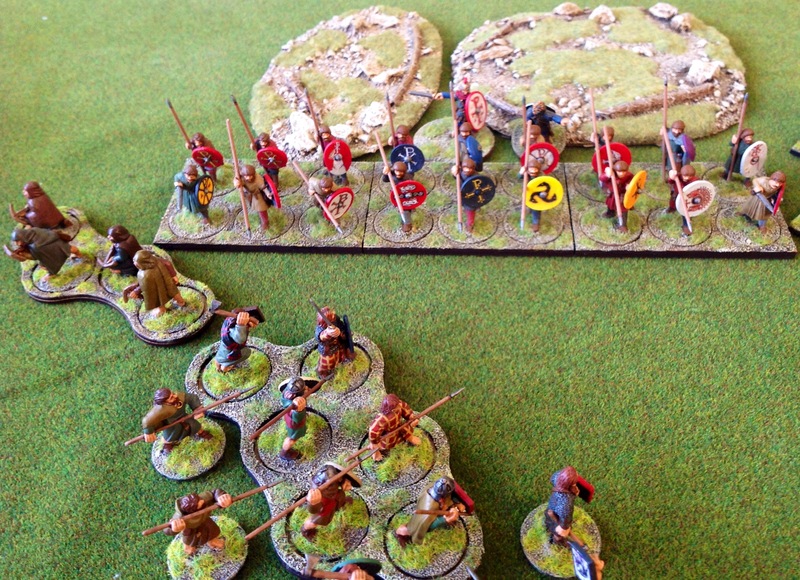 The second round was much better for the Picts, when they killed 5 British though they still took 2 casualties back in return. No noble was wounded in the exchange and the losing Levy had to fall back 6″, though 1 group with more shock than men had to go back further. 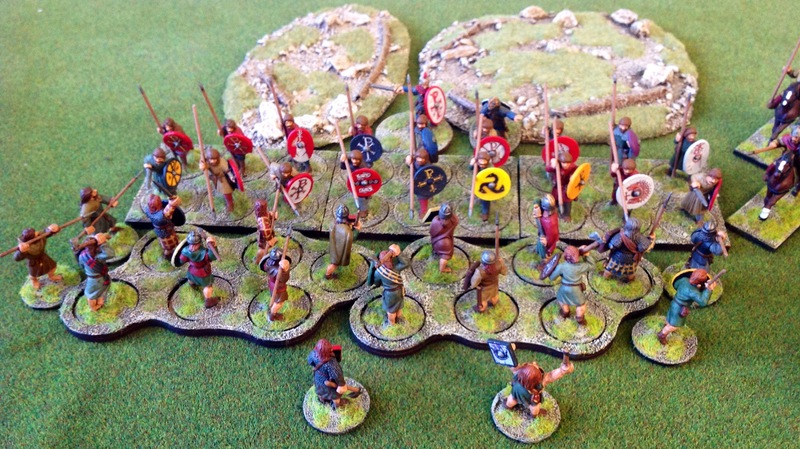 Although they were victorious, the Picts also were carrying excess shock so fell back 2″. On reflection, the British probably won that melee as it was going to take a lot of rallying to remove the shock accumulated by the Picts and time was something the Picts did not have. 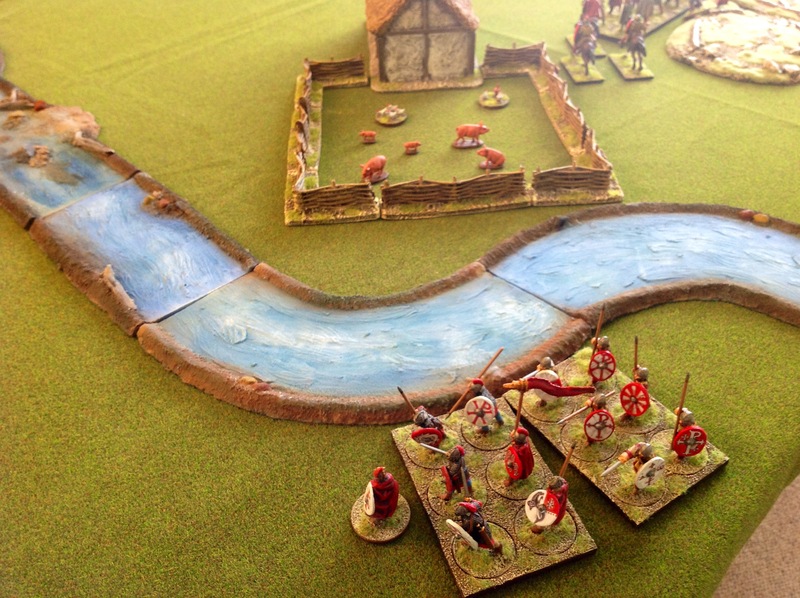 Meanwhile, the Pict cavalry arrived at the ford as the British Lord started rallying shock off his Levy. The cavalry didn’t hold the ford for long though as the British played a “Bounding Move” card and they had to evade away from the elite British infantry. 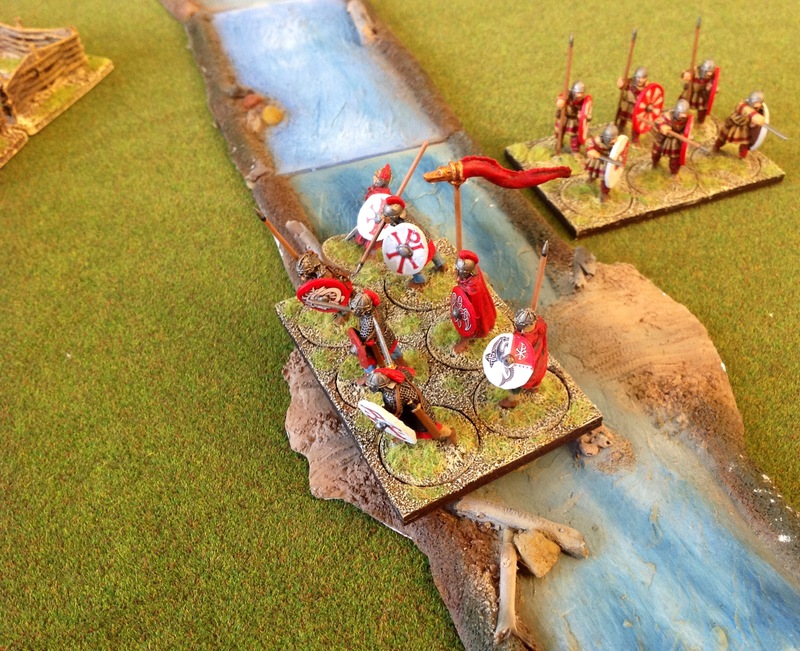 They rolled high for the evade and ended up quite a way back from the ford – perhaps a bit too far back…. Out came the British cavalry card, giving them their chance. 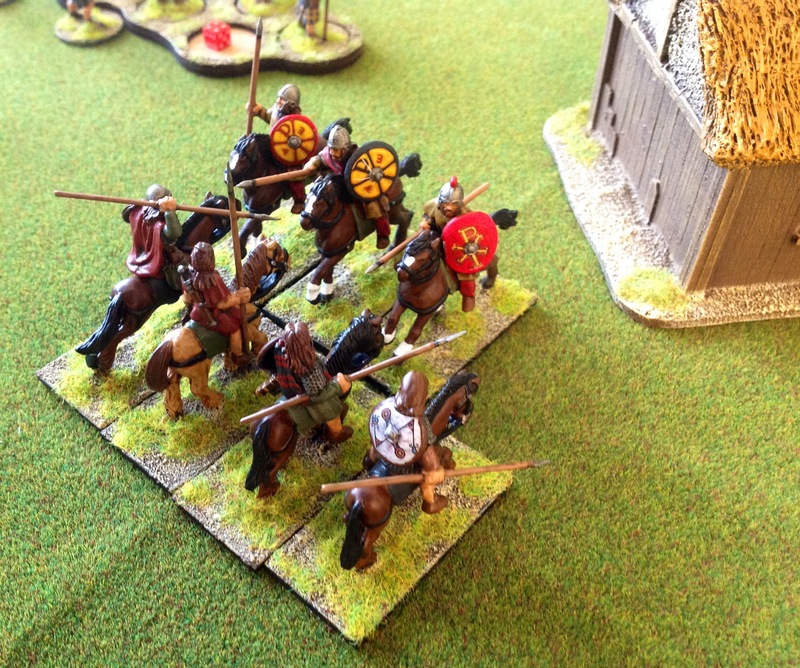 While the Pict Lord was forced to rally shock, the mounted British charged through the gap between the Lord’s forces and the farm and engaged the Pict cavalry head-on. 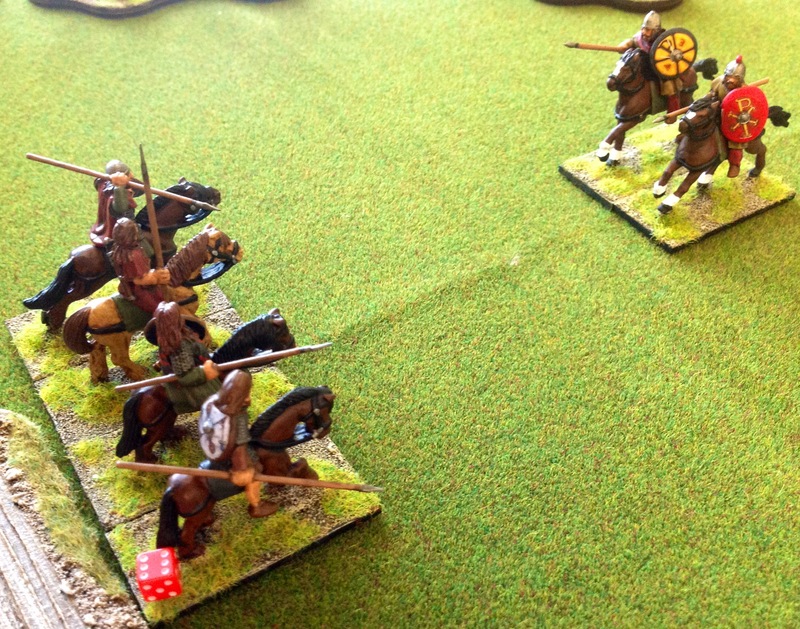 Rolling 8 dice & inflicting double shock for being Shock cavalry resulted in no dead but 6 shock in exchange for 1 dead in the second round of combat. 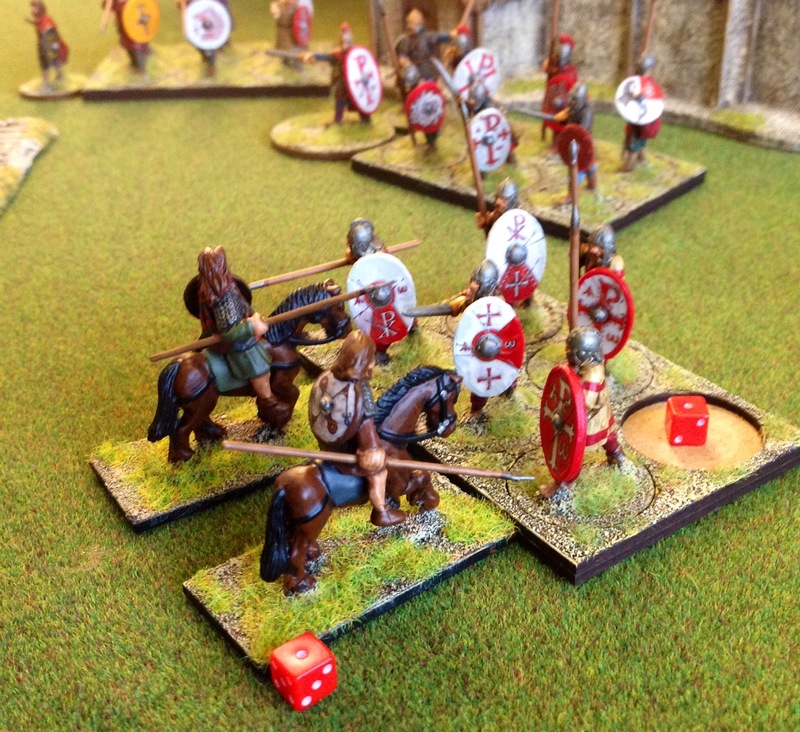 The shocked Picts fell back – by the end of the turn Cinuit was able to rally shock from the British cavalry, leaving them ready to charge again. No dead but 6 shock!!! Amazingly, the British Noble cards all came up in the first cards drawn, so the Levy got shock rallied off them and one of the Fate cards drawn was the “Artorious” card. 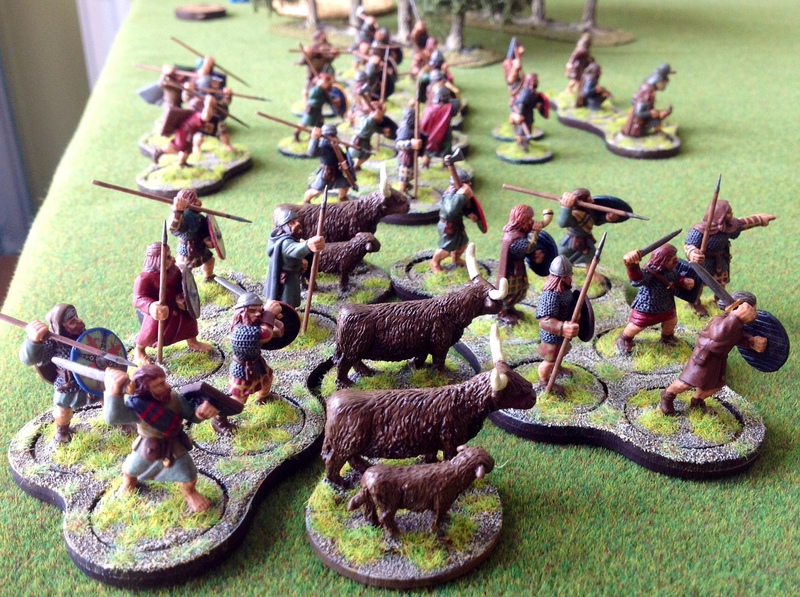 The Picts with the cows moved next, only managing a move of 4″ and positioning themselves precariously behind the Pict cavalry. Predictably, the British cavalry card emerged next and the 1 remaining cavalryman and attached Noble threw caution to the winds and charged the still shocked Pict cavalry. 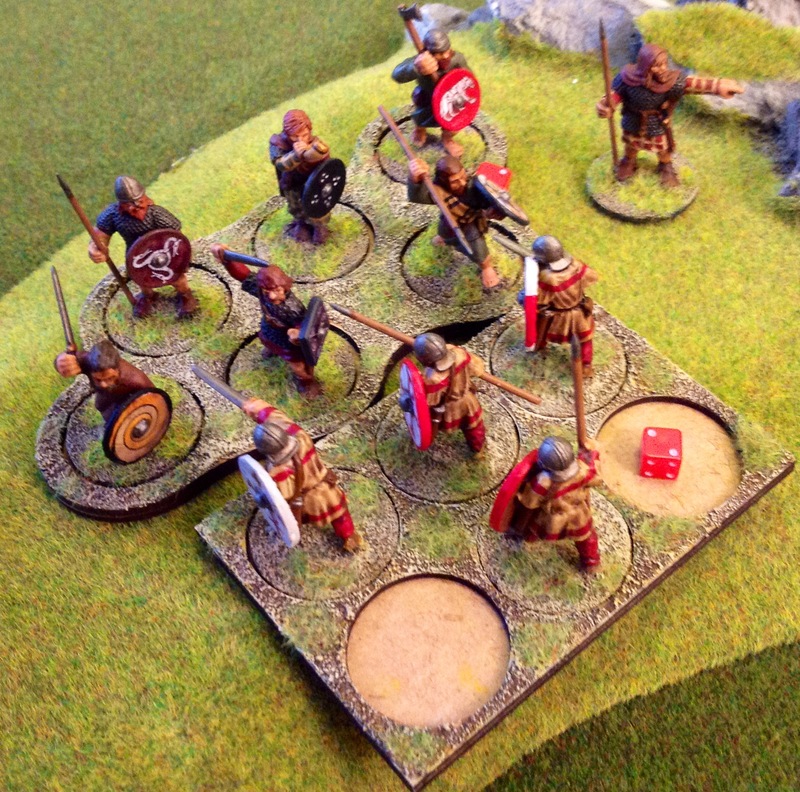 The attached Noble allowed the play of the “Artoroius” card, giving +1 to hit on 6 dice. 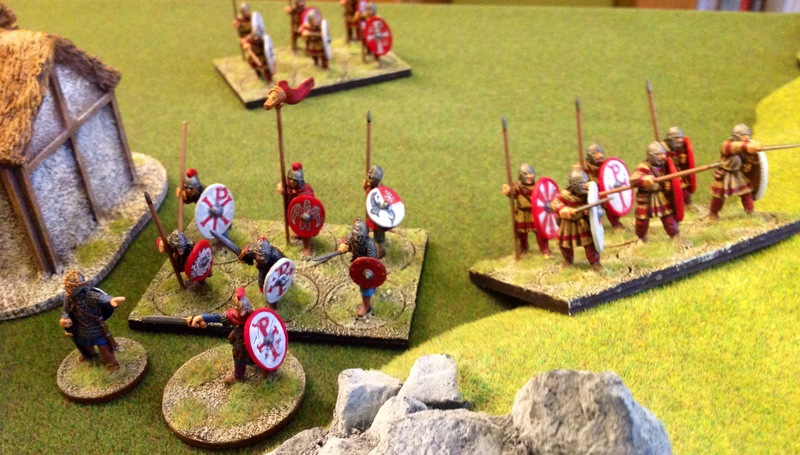 One Pict died and another 3 shock was added, but the Picts killed the last remaining cavalryman in return. As the Picts now had double the amount of shock than they had men they had to fall back, but this was through the cattle herding raiders behind them, gifting them 6 shock on the way through. With 6 shock on one of their Raider bands, there was little point going on. 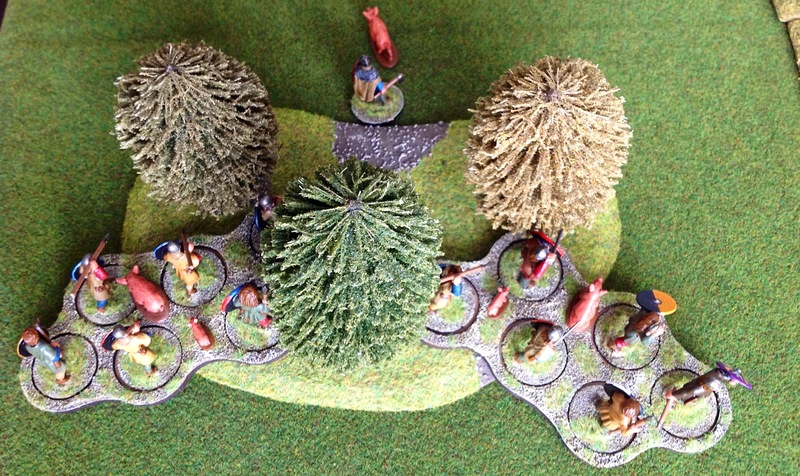 The Elite British Warriors could take them out in their fragile state and losing the cattle would end the game. 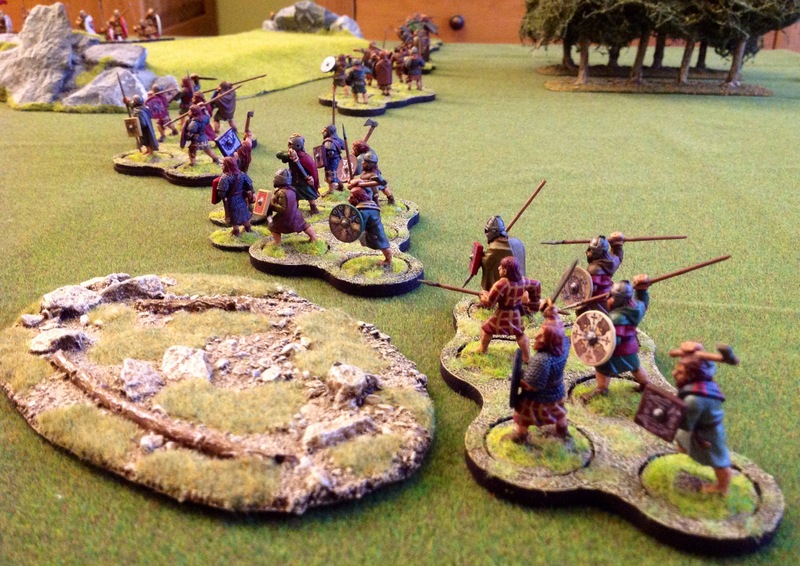 It was a tough mission for the Picts because they not only needed to guard their flank but also needed enough troops in reserve with cattle to fight their way across a defended ford. In the end a good run of turn and Fate cards for the British ended the game quickly. 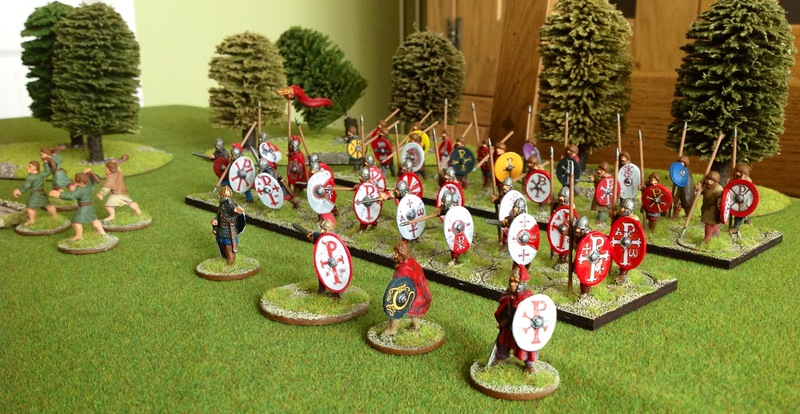 Although it was a victory for the British, it came at a heavy price in terms of casualties – they suffered moderate losses which would take 2 months to replace, whereas the Picts only suffered light losses, so would be back raiding unopposed in June. 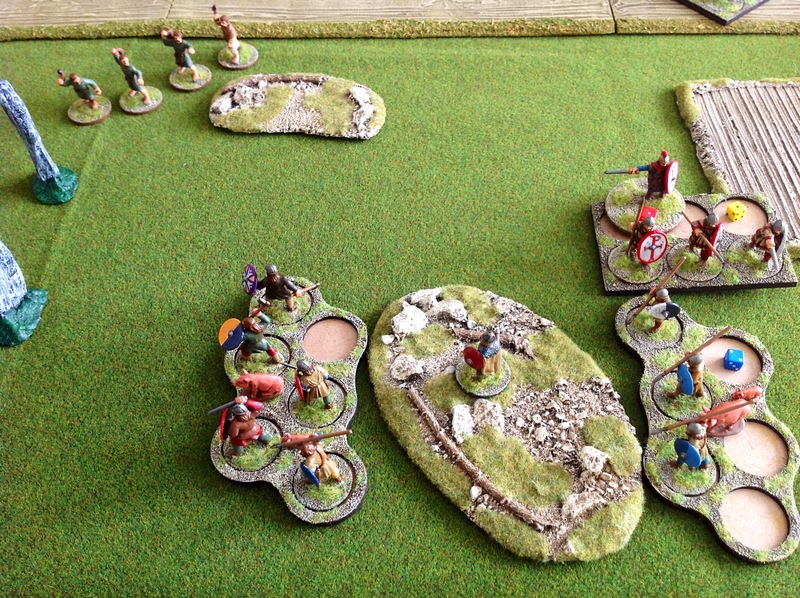 The British gained a Beggar’s Bowl of wealth for their victory (+1 taking them to 4 in total) but the Picts bettered that in unopposed raiding in June, taking a Thief’s Horde in loot (+2 bringing them up to 8 wealth). The problem with all this loot was that Picts need wounds to gain honour to progress, and try as he might Galan the Insane had failed to get wounded. The British however had obtained (painted up?) 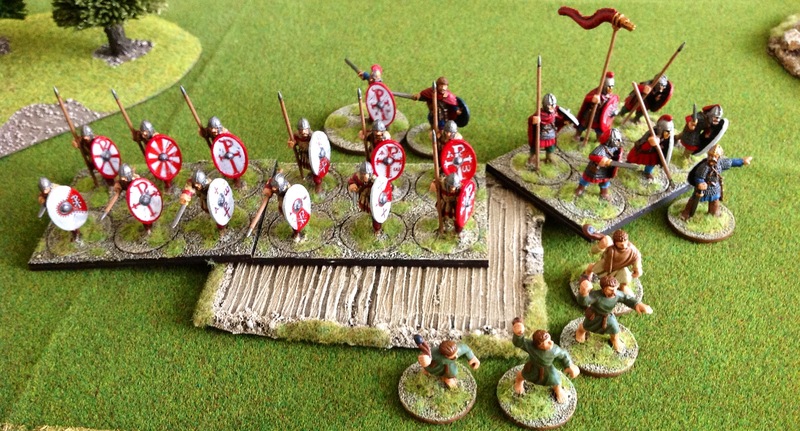 some mounts for their Nobles, so come July the Picts would be facing 2 units of British cavalry led by a Noble – maybe Galen would end up skewered on one of their lances…but where’s the honour in that?